Mash potato. With vanilla add powder sugar until it is like pie dough. Flatten then cut into square. 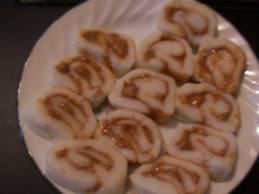 Spread peanut butter and roll up like pin wheel then cut and serve.